The Finnish Society for Sports History, The Finnish Society of Sport Sciences, The Department of History and Ethnology and the Faculty of Sport and Health Sciences jointly organize the Ski Congress 2017 at the University of Jyväskylä, Finland, 1st–4th of March, 2017. We invite to the Congress researchers and scholars to discuss and analyze the international relations of skiing, its societal significance and impact on human physical and mental well-being. We want to touch upon the climatic moments and sore points which skiing has brought about. We understand skiing as multi-faceted outdoor recreation which includes all traditional winter sports in skiing as well as ways to move and exercise on skis, including skiing tourism. History is the main field of study in the Congress but we want to approach winter sports and recreation multi-scientifically. Along with historians we expect that representatives of ethnology, physical education, museology, sociology and media sciences among others answer our call as we aim at encompassing the Congress thematic from past to the future. The Congress languages are English and Finnish. Concerning the Congress programme: On the 1st of March we share the opening ceremony and enjoy the welcome reception. The 2nd and 3rd of March are reserved for the scientific programme. 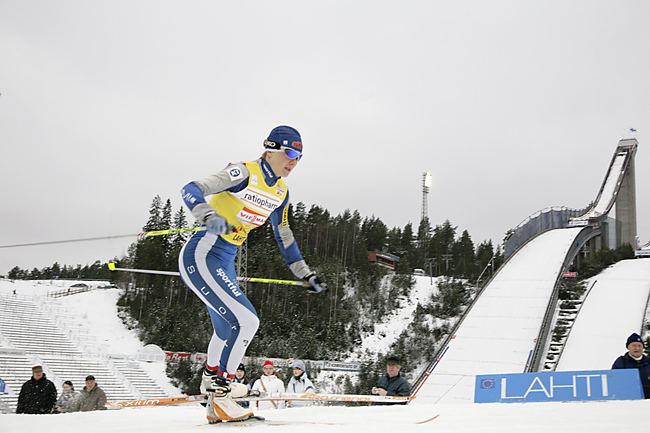 On the 4th of March there is a possibility to join an excursion to the World Championships of Skiing in Lahti. One can also visit the Lahti Museum for Skiing there. We ask all interested to send the abstracts of their presentations (one A4) to Congress Secretary Piia Pöyhönen (piia.poyhonen(at)lts.fi) the 31st of October the latest. The scientific committee of the Congress is composed of Professor Hannu Itkonen, Docent Heikki Roiko-Jokela, Docent Anssi Halmesvirta, Dr Jari Kanerva, Dr Arja Turunen and Ph.D. Antero Holmila from the University of Jyväskylä. Ski Congress 2017 Jyväskylä shall edit Congress proceedings from selected presentations. Notification to authors of acceptance of abstract will be send the 30 th of November the latest. We ask the authors to send in a written summary of c. 12.000 bytes. The Patron for Ski Congress 2017 is the International Society for the History of Physical Education and Sport (ISHPES). 31st of October 2016 Abstract submission closes. The congress fee includes access to conference presentations and materials, opening reception, lunches, coffees and conference dinner. The excursion fee to Lahti2017 FIS Nordic World Ski Championships includes, the trip Jyväskylä-Lahti-Jyväskylä, ticket to competition 1 (CC Ladies 30 km Free and Men Team Competition HS130) and a visit to Lahti Ski Museum. Accommodation and travelling costs are not included in the conference fees. Further details on accommodation options can be found below. Registration to Ski Congress 2017 is open and closes the 10th of February 2017. Cancellation made before the 13th of February, the refund is 100 % of the fee. Cancellation made after the 13th of February 2017, the fee is not refundable. Cancellation is made to Linda Raivio (linda.raivio(at)lts.fi). The conference venue is the H-building at the University of Jyväskylä. The opening ceremony will take place at the H-building of University of Jyväskylä Campus on Wednesday the 1st of March 2017 from 17.00 o’clock. The Congress Dinner will be on Thursday the 2nd of March 2017 from 19.00 o’clock. The place will be announced later. Conference participants are responsible for reserving their own hotel accommodation. We recommend that all participants reserve their hotel accommodation as soon as possible. We have pre-booked a fixed number of rooms with special prices. Please book the rooms directly from the hotels by telephone, email or Internet using the booking code. Please check the reservation and cancellation policy of the hotels while making your reservation. To make your booking, see the information below. Set in the middle of beautiful lake scenery, the Alba Hotel is only a kilometer from the centre of Jyväskylä. The hotel is also near the place where the congress will be held. Free parking, some slots equipped with car-heater points. Restaurant and two conference rooms, sauna. Partly-covered summer terrace with a view of the lake. Hotel Scandic Jyväskylä stands only a stone’s throw from Jyvaskyla city centre, offering a great location for your Jyväskylä visit. Attractions such as Jyväskylä harbor and the promenade with shops are located a short walk from the hotel. The city’s tourist centre is only a 5 minute walk away. The city of Jyväskylä is located in Central Finland, some 270 km north of Helsinki, and is best reached by plane, train or bus. The connections are relatively frequent and the journey from Helsinki to Jyväskylä takes 3-4 hours by train. By Plane: Most of the flights to Finland arrive at Helsinki-Vantaa Airport (about 20 km from the centre of Helsinki). From Helsinki-Vantaa Airport you may continue by plane, by bus or by train to Jyväskylä. Should you continue by plane, you will arrive at Jyväskylä airport some 25 minutes after the take-off. The airport is located about 16 km from the centre of Jyväskylä. There is not a regular bus connection from the airport to the centre of the town, you might need to take a taxi to the center of town. Please book the connecting flight at your local travel agency. Please note that it is advisable to book a taxi from Jyväskylä airport to your hotel already while arriving to Helsinki! There is not taxis available in the Jyvaskyla airport without booking made in advance. Taxi Jyväskylä: +358100 6900. By Bus: There is a direct bus connection from Helsinki-Vantaa Airport to Jyväskylä . The trip will take 4 -5 hours. The timetable for buses: http://www.matkahuolto.com. The buses leave next to the International terminal at the airport.